FILE - A Myanmar police officer stands watch as journalists arrive in the village of Shwe Zar, in the northern part of Myanmar's Rakhine state, Sept. 6, 2017. Conspiracy theories have hounded media coverage of the Rohingya crisis in Myanmar, which many view as biased against the largely Buddhist country. These include allegations that Muslims have undue influence at the BBC and that the Organization of Islamic Cooperation is paying foreign journalists to produce the stories they want. The complaints stem from a genuine concern that the media has focused a disproportionate amount of attention on the more than 400,000 Rohingya who have fled violence in Myanmar and the allegations of extrajudicial killings and massacres that they have brought with them. Their plight has reached the highest levels of global power, with U.S. Vice President Mike Pence on Wednesday referring to the developments as a "great tragedy unfolding." By contrast, many here argue, journalists - and then the leaders who read the stories - ignore or fail to mention the Arakan Rohingya Salvation Army attacks that sparked the military crackdown, the tens of thousands of non-Muslim civilians who have fled their homes, and the deaths of Buddhists, Hindus and members of ethnic minorities caught up in the conflict. A week before her speech, an op-ed writer in state media observed, “the reports written by a handful of respected journalists and scholars from the international community who reported on the actual events, nearly disappeared under the overwhelming and powerful influence of foreign media." But how does a perhaps expected feeling of international bias sprout into more far-fetched theories? Richard Horsey, an independent Myanmar analyst, said in an email that while the Arakan Rohingya Salvation Army has received funding from outside the country, both from the diaspora and non-Rohingya donors, the outside media support contentions which may date back to deeper, historical grievances. FILE - Flames engulf a house in Gawdu Zara village, northern Rakhine state, Myanmar, Sept. 7, 2017. 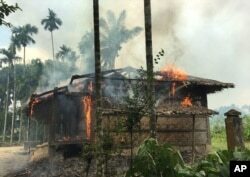 In a video, widely circulated in Myanmar, a respected Buddhist monk blamed arson incidents in Rakhine state on Muslim extremists. This kind of thinking is not limited to the fringes of society. In a September 8 video circulating online in Myanmar, a prominent and respected Buddhist monk seemed to legitimize the view. FILE - Rohingya Muslims, who crossed over recently from Myanmar into Bangladesh, wait to receive food being distributed near Balukhali refugee camp in Cox's Bazar, Bangladesh, Sept. 19, 2017. In a speech Tuesday, Myanmar's de facto leader, Aung San Suu Kyi, claimed that "the world is totally unaware" that not just Muslims but also Buddhists and members of various minority sects have had to flee the violence in Rakhine state. The video has been viewed 1.2 million times on Facebook. Pressure from the international community and critical coverage of Myanmar is, of course, nothing new. The pro-democracy struggle, the Saffron Revolution in 2007, Cyclone Nargis in 2008. All led to coverage that the then-junta despised. But Myanmar’s political and economic reforms, launched in 2011 and culminating with the election of Aung San Suu Kyi’s party in 2015, changed the landscape. Aye Chan Naing, the Yangon-bureau chief of the Democratic Voice of Burma, said the accusations of funding by the Organization of Islamic Cooperation have been “floating around” since inter-communal violence erupted in Rakhine state in 2012, and are easily distributed with wider Internet access. One of the problems is limited media access to northern Rakhine state where the conflict is centered. Most of the media visits have been via guided press trips. The vacuum creates fertile ground for rumors. Accusations of bias also feed into other aspects of the crisis, such as aid from international NGOs, which local Rakhine have long accused of favoring the Rohingya. On Wednesday, security forces in the Rakhine state capital of Sittwe had to break up a mob that gathered in an attempt to disrupt a shipment of aid.